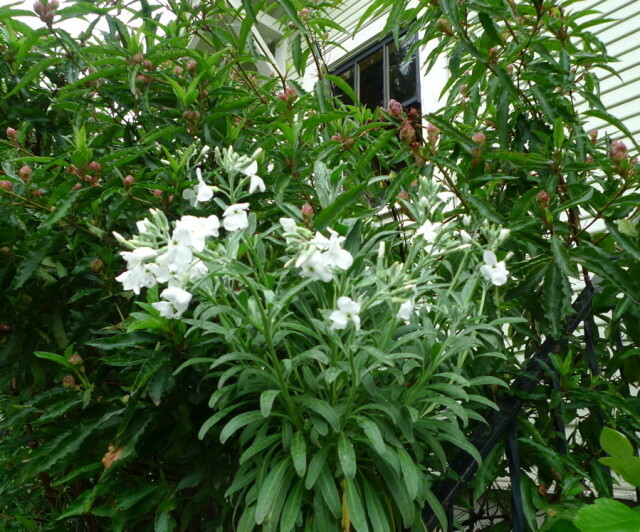 Perennial stock – Matthiola fruticulosa – has reached nearly 5’ tall in my garden, thanks to the support of a stair railing. Plant it close to outdoor seating areas and near doors and windows… The scent is particularly powerful at night. If your grandma had any influence over you at all, you’d be familiar with the plant commonly known as stock. It’s a marvelously old-fashioned plant, beloved to cottage gardeners and still grown in England. Stock fell out of favor some time in the past 20 years. Admittedly, the plants are pretty gawky, and the spent flowers need to be cut off to keep it looking tidy (unlike so many modern annuals that "deadhead" themselves because they’re sterile and cannot be pollinated, so just drop their spent flowers). Somehow, stock was superceded by showier, fancier annual plants over the past 20 years or so. Today, those little trays of pink, purple and white annual stock takes up very little real estate on nursery tables – if you can even find it. Enter the amazing perennial stock plant: Matthiola fruticulosa, a cold-hardy, white, over-wintering shrubby species that has proven itself pretty cold-hardy over the past decade in Portland gardens. This small, rounded, woody shrub (about 2×2 feet) has delicious blue-gray-tinted foliage and produces masses of flowers in April and May. One year-old plants don’t flower so if you buy it this spring without flowers on it, just hold tight: it will flower next year. And when it does, prepare to have your socks knocked off. The flowers are the most luminous, loveliest white you’ve ever seen, with a tiny hint of green at the center. Even better, they have a rich, powerful scent of cloves which is especially potent at night. The fragrance is so tantalizingly delicious, you might just feel compelled to keep a bouquet of blossoms close to your bedside. An extra nice touch is that after flowering, the plant sets prolific seed and in fall, you’ll have plenty of seedlings to populate your own and friends’ gardens. Plants can last from a couple of years to about five years, at which time, they’re often lanky and can be replaced with one of the many progeny that have sprung up. They look great planted amidst drought-tolerant shrubs like sun roses, rosemary, and even spiky plants like yucca, but they look nice with roses and hardy geraniums, too. The plants thrive in well-drained soil and require only occasional water in summer. They are bushy in full sun but if you plant them behind another shrub or near a fence, they can sometimes weave their way through it.